Yesterday I wrote about a service called StartupFollower, which allows users to sign up for email notifications when TechCrunch writes about their favorite startups. Today, after receiving 738 signups and 3138 total company follows post launch, founder Tim Suzman sent us the StartupFollower follow distribution list. While informal, the list gives a rough idea of which companies our readers want to receive news about, based on subscriptions. Prior to StartupFollower, we knew that 23% of you wanted to read more news about companies, but we had no concrete idea which ones. 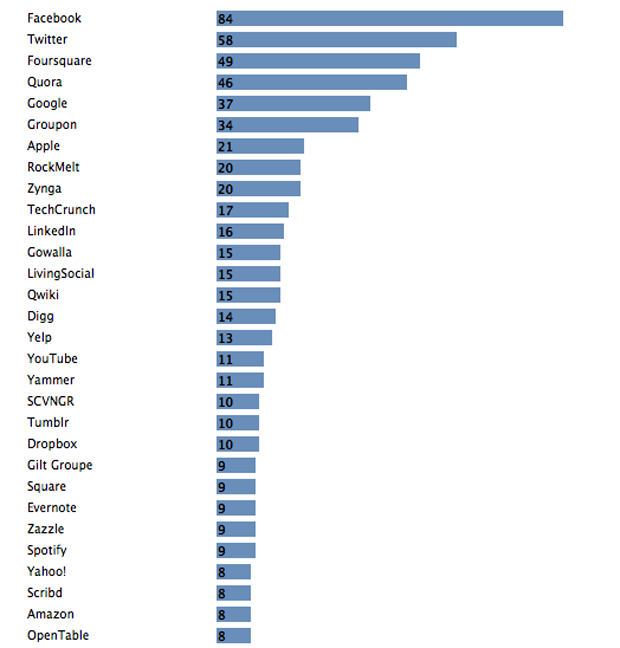 Now we know that Facebook, Twitter, Foursquare, Quora, Google, Groupon, Apple, RockMelt, Zynga and TechCrunch are on your top ten list, or at least they were yesterday. And, allowing for a disproportionate following of startups that were recently on TC (eh hem Rockmelt) the list jives pretty well with the amount we cover rockstars like Facebook and Twitter, for example. Likewise, we and other tech publications often get dinged in the comments for covering biggies like Apple too much, but how could we ignore the fact that Microsoft is below Box.net in the amount of people who want to subscribe to MSFT related news? Other notable bottom feeders? IBM, Craigslist and Diaspora. But hey at least they made the list, which is now up to 1387 unique companies followed. Feel free to include any others you think should be on here in the comments. Note: Because technically the definition of a startup is “a fledgling enterprise,” it’s pretty debatable which companies on this list are still in the startup stage. Even we’re not that sure, behemoth Facebook won last year’s Crunchie for “Best Overall Startup,” no joke.